Bill had two advantages – he cared more about craftsmanship than money and he was a remarkably persistent man. So, using gentle winter wheat – instead of rye – and pure limestone spring water, Bill spent six long years getting it right. After some small fires and considerable trial and error, Maker’s Mark® was born. 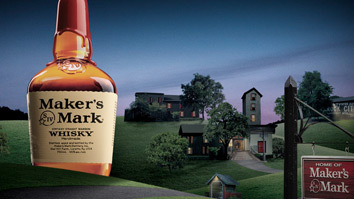 In the fall of 1958, Maker’s Mark® was finally available for market after six summers of aging. The first bottle was four-fifths of a quart and sold for $6.79 a bottle. Like every single bottle of Maker’s Mark® to this very day, it was hand-dipped in our signature red wax. While most distilleries use a modern hammer mill to break up their grains, Maker’s Mark uses an old antique roller mill, which is less efficient, but reduces the chance of scorching the grain and creating a bitter taste.